My good friend Vicki Garrett created this wonderful Decor Board. Isn't it wonderful?!? Ink up the Bumpy Side of the Texture Fade with Versamark Ink , insert the Black Cardstock and run it through your Big Shot Machine. 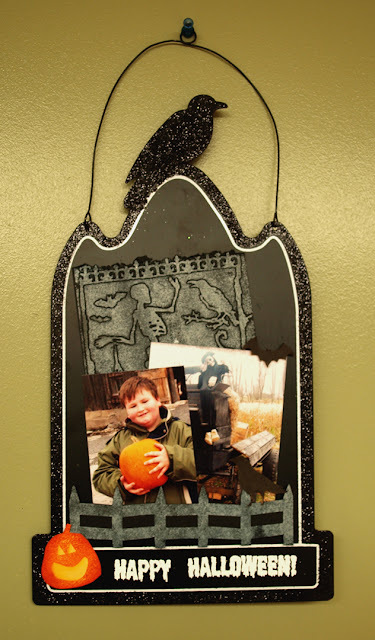 Cover with Weathered Wood embossing powder, shake off and heat set, layer onto the metal board with a strong adhesive. Stamp the Fence from Solids4Halloween with versamark, heat emboss with Weathered Wood embossing powder, heat set and trim. Stamp the Bat and Raven from Solids4Halloween in Licorice ink , the Pumpkin in Tangerine on Yellow Cardstock, cut out and set aside. Note: you can add a little more dimension by sponging the tangerine ink onto the left side of the pumpkin. Stamp the Happy Halloween sentiment from Spooky2Scare with versamark ink directly onto the metal board. Heat Set (be careful as the board will get hot~!). Add the pictures to the Board and assemble as shown using a strong adhesive.